BusStop Mag: Skatelab + Wal-Mart = ? 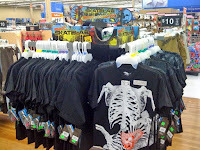 Be sure to check out your local Walmart and buy some of the new SKATELAB GEAR. Shirts and hats only $7.50! More cool stuff coming soon!!" I wonder what other cool stuff is on the way? I know that with the current economy, a good number of local skate shops have felt the pinch. Is this Skatelab's way of staying afloat? With this news, I do want to point out that before you start shouting the "S" word, keep this in mind: Skatelab in Atlantic Beach is still providing loads of kids at the beach with a place to skate after school, and they even have a van that drives around picking kids up. That's called building community. I hate Wal-Mart just as much as everyone else, for sure, but in the back of my head, I'm thinking this might just be good for the park in the long run. I didn't exactly feel the same way about that Mike McGill business. This had nothing to do with FLA SLAB. This was all Todd Huber's (SLAB CA) idea. This isn't helping Brian and Kelly. This is killing their business.